So many people procrastinate drafting wills that less than half of American adults have last testaments, according to the American Bar Association. A will not only allows you to specify who is to inherit your property, it also is the vehicle for selecting an executor to administer your estate and a guardian to care for your minor children. Large and complicated holdings benefit from estate counsel, but a simple will drawn up at home works well in many cases. Wills cannot devise certain holdings like life insurance policies with designated beneficiaries. Select a form will carefully. Look first to see if your state statutes contain a statutory form will. Alternatively, obtain a form will from the state court system or bar association. Read through the form will completely. Blanks to fill in follow three steps as: identification of the person drafting the will, bequests and appointments, and signature. Prepared wills must be witnessed. Fill in the initial blanks with your full name, address and other identifying information. If you intend to name more than a few heirs, write out your bequests on draft paper first. When you are ready, fill in your bequest information in the appropriate section of the form will. Identify the heirs by full name and address to prevent confusion later. Identify property specifically as well, by parcel number if real estate, account number if investments or cash, or license numbers if vehicles. Consider naming a residual beneficiary to inherit anything you forgot to devise specifically to someone else. Select an executor for your estate. Choose someone you trust who is well organized and experienced in business matters. The executor administers your estate after you die. She files the will in probate, gathers assets, pays bills and distributes property according to the terms of your will. Identify your choice for executor in the form will section by full name, address and phone number. Check with her before executing the will to be sure she accepts the appointment. Select a guardian for your minor children, if any, and fill in that information. A surviving spouse usually assumes the care of the children, but your spouse may not survive you. Execute your will according to the laws of your state. All states require that at least two witnesses affirm your signature. Select people who are over the age of 18 and not heirs under your will. Tell the witnesses that the document is your last will and testament, then sign the will in front of them. Each witness signs in the appropriate blank under your signature. 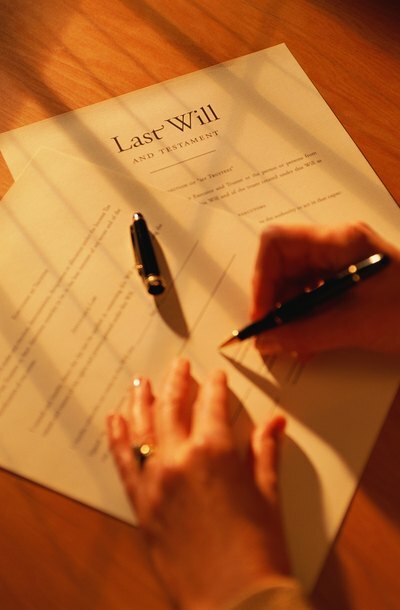 More than half of Americans don't have a will, according to the American Bar Association. Whether due to fear of death or lawyers' bills, many people procrastinate drafting a last testament. Yet a simple will is the task of a few hours, and proper execution is a matter of minutes -- if you understand the few procedural requirements. Those with large holdings or complicated estates may do better with tax and legal advice.